Gabriel García Márquez’s fiction owes its fascination to a tension between intimacy and remoteness. The narrative worlds of One Hundred Years of Solitude (1967) and Love in the Time of Cholera (1985) are intensely personal without being obviously autobiographical. The sculpted narrative voice, with its old-storyteller self-assurance, rebuffs elementary attempts to peer into the author’s psyche. Never having written a novel as overtly confessional as Mario Vargas Llosa’s Aunt Julia and the Scriptwriter (1977) or Carlos Fuentes’s Diana, the Goddess Who Hunts Alone (1996), García Márquez, by comparison with his Spanish American contemporaries, exerts the appeal of a familiar enigma. García Márquez was in his thirties when he perfected his old storyteller voice. Now in his mid-seventies, he has allowed the voice to grow more relaxed and confiding as he turns to the first volume of his memoirs, Living to Tell the Tale (2002). The respected translator Edith Grossman has rarely been challenged as she has here. She resorts to footnotes to explain regionalisms and puns; in spite of a good general rendering, Grossman does not quite capture the intimate quality of the original. The anecdotal directness of this memoir is recognizable from García Márquez’s journalism, yet above all the tone recalls his fiction. The enthusiasm with which this book has been read throughout the Americas in its Spanish-language edition owes much to its unmasking of the autobiographical sources of the novels. The dramatic opening, where the author’s mother, Luisa Márquez, hunts down the impoverished aspiring writer in a café in Barranquilla and asks him to accompany her into the jungles of his childhood to sell the family home, begins a process of exposing the prototypes for the fiction, giving the reader the illusion of breaking through the carapace of the García Márquez narrative voice to understand the genesis of his novels. Some of the prototypes are obvious, such as Colonel Nicolás Márquez, the author’s maternal grandfather, with whom García Márquez lived for his first eight years, and who would become the model for Colonel Aureliano Buendía in One Hundred Years of Solitude and the stoic veteran of Colombia’s civil wars waiting for a pension that never arrives in No One Writes to the Colonel (1961). Colonel Márquez revered the memory of Simón Bolívar, “the greatest man ever born in the history of the world.” A painting of Bolívar ’s corpse hung in the family living room. When the infant García Márquez asks his grandfather if Bolívar is greater than Jesus Christ, the reader sees the first glimmerings of The General in His Labyrinth (1989) taking shape. In similar fashion, Macondo turns out to be a decayed banana plantation on the edge of García Márquez’s native town of Aracataca. He had used the name in three books before he learned that it was a tropical tree. The most engrossing points of connection with the novels are those on which García Márquez does not comment. The oldest of his family’s eleven children (his father had five other children by extra-marital liaisons), García Márquez spent much of his early childhood separated from his mother, whose defining role in his life is evident in his dramatic claim that her death in June 2002, at the age of ninety-seven, coincided to the hour with his completion of this memoir. One of their reunions was arranged to celebrate the birth of his younger sister, Margot. As an infant the little girl refused food, eating the damp earth of the garden like Rebeca Buendía; in One Hundred Years of Solitude, the infant’s taste for earth is transferred to an adolescent. The images of a mother entering a silent town to reclaim the body of a son shot trying to commit burglary, of the Colonel’s illegitimate sons visiting him once a year, and of a priest who is reputed to levitate during Mass, contribute to the illusion of understanding the novels’ origins. But this is an illusion. García Márquez insists that, “Life is not what one lived, but . . . how one remembers it in order to recount it.” Doubt has been cast on whether García Márquez actually made the return trip up the Magdalena River with his mother with which the memoirs open. In a sense it doesn't matter whether what we discover beneath the fiction is simply another fiction, as long as the reader believes he has found a truth. The illusion of understanding the novels’ origins is most persuasive in the case of a Belgian refugee from the First World War, a chess companion of Colonel Márquez, who committed suicide by inhaling a cyanide solution. After observing the body, the infant García Márquez utters the bon mot, “The Belgian won’t be playing chess anymore.” The phrase is repeated by the women of the family to the point where the author looks back on it as “my first literary success.” The scene illustrates how the novelist’s imagination parses images from life as fictional creations: the Belgian becomes the model for Gaston, the Belgian who brings a debased version of Western technology to Macondo in the final pages of One Hundred Years of Solitude, while his suicide evolves into the opening scene of Love in the Time of Cholera, where Dr. Urbino examines the body of his chess partner, the West Indian refugee Jeremiah de Saint-Amour, who has committed suicide by inhaling a cyanide solution. Colonel Márquez’s death expelled his grandson from the decaying jungle town into the chaos of a very large, very poor family. Having reunited the family on the Caribbean coast, García Márquez’s father, a mercurial man, invested his savings in a pharmacy. When the business failed, he took off up the Magdalena River, naming his eleven-year-old son head of a swarming household that lacked financial support. García Márquez’s school years were marked by ugly poverty: head lice, rickets, hunger. The features typical of a writer ’s upbringing – the perpetual reading, the occasional teacher who recognized his abilities – are lent a distinctively Caribbean flavour by the predominance of oral culture. The future writer read the poets of the Spanish Golden Age in order to memorize and recite them; as an adolescent he entered singing contests. It was for one of these that his mother, his accomplice in keeping the family clothed and fed, requested he register not only with his paternal surname, García, but also with the maternal Márquez. In his father’s absence, the young Gabriel José García was evolving into Gabriel García Márquez. He won a scholarship to a good secondary school, but at fifteen he became embroiled in a dangerous affair with a married woman whose husband had a reputation for violence. A move was necessary, and he reluctantly consented to go to Bogotá, “a remote, lugubrious city where an insomniac rain had been falling since the beginning of the sixteenth century.” His pilgrimage by riverboat to the chilly Andean capital in search of a scholarship led him to a boarding school that transformed him from a Caribbean regionalist into a man with a vision of a varied but unified Colombian nation. García Márquez belongs to a relatively fortunate generation of Colombians who grew up between the end of the civil wars at the beginning of the twentieth century and the outbreak of La Violencia, when war again became the country’s daily reality. The destruction of this period of peace dominates the second half of the memoir and inspires some of its most gripping passages. The assassination of the maverick Liberal presidential candidate Jorge Eliécer Gaitán, on April 9, 1948, is the crucial watershed in twentieth-century Colombian history: the moment when reform failed. After Gaitán’s death, the old political parties, the Liberals and the Conservatives, locked themselves into a brutal struggle which over the next decades would corrode civil society, allowing the parallel powers of guerrilla armies, death squads and drug traffickers to dominate public life. In 1948 García Márquez was a first-year law student who had published three short stories. He arrived on the scene a few minutes after the assassination. His vivid description of a suspicious, well-dressed man urging the out- raged crowd to kill the supposed assassin is a startling addition to to debates about the events of that day, which exerts an influence on Colombians similar to that of the assassination of John F. Kennedy on Americans. As fighting between Liberal and Conservative supporters in the weeks after the assassination left most of Bogotá in smouldering ruins, García Márquez escaped to the Caribbean coast. In Barranquilla and Cartagena, he slept in parks, on beaches and in brothels, earned pocket money by writing a newspaper column, argued about books, abandoned a first attempt at a novel and began the agonizing composition of the Faulknerian novella Leaf Storm (1955). García Márquez’s assessment of his personality during these years is bleak. “My poverty was absolute, and I had the timidity of a quail, which I tried to counteract with insufferable arrogance and brutal frankness. I felt I did not belong anywhere, and even certain acquaintances made me aware of this.” Yet his torrential activity tells a more complicated story. The memoir reveals glimpses of a man of supernatural vitality, great social gifts and workaholic determination. The reader sees the distinctive García Márquez style, characterized by the elimination of adverbs and the compression of dialogue into single declarative statements, emerging from the meshing of his journalistic apprenticeship and his memories of his grandparents’ house. On visits to the Magdalena River town of Sucre, where his parents had settled, he met Mercedes Barcha. Following the custom of the time, he remained emotionally loyal to her during their long courtship while continuing to frequent the brothels. In this book’s last line of dialogue, García Márquez tells an acquaintance that he still does not know who he is. Yet with the publication of Leaf Storm he had begun the process of mythologizing his past in a way that would give birth to the confident voice of the old storyteller. By his late twenties García Márquez was a professional journalist. He worked for the Bogotá newspaper El Espectador during its days as one of Latin America’s great institutions of investigative reporting. Non-aficionados may find the final chapter of this book, with its detailed account of Colombian journalism during the 1950s, less riveting than the rest. But this suggestive, impassioned, surprisingly vulnerable memoir is certain to stand as one of García Márquez’s most important books. 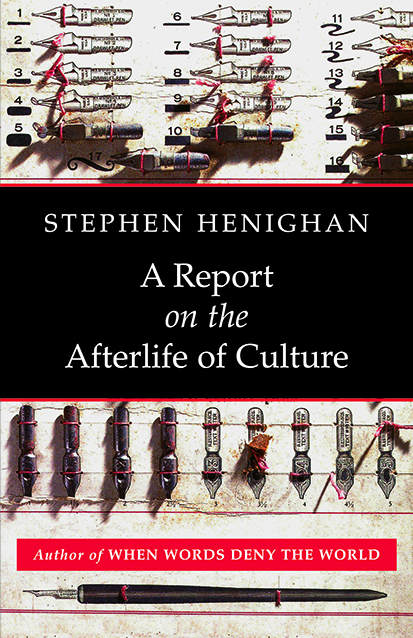 Stephen Henighan's translations include Ondjaki's Granma Nineteen and the Soviet's Secret and Mihail Sebastian's The Accident. He is the author of a dozen books of fiction, reportage and criticism, including the short story collection A Grave in the Air and the essay A Green Reef: The Impact of Climate Change. He teaches at the University of Guelph, Ontario.